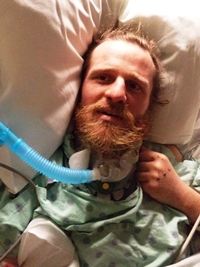 Steve is newly paralyzed and needs your help. My husband, Steve Holdeman, was recently critically injured in a serious crash. His car was sandwiched between a tractor-trailer and another vehicle and he suffered a spinal cord injury which has left him paralyzed from the waist down. Steve has always led an extremely active lifestyle that included deep-wilderness camping, hiking, bicycling, off-roading, motorcycling, and spirited play with our two children. He has always loved anything related to cars and machines, and has been a mechanic his entire working life. Steve specialized in diesel maintenance, but he will likely not be able to do that kind of work anymore. The crash has forced us to sell our home because it is not wheelchair accessible and is ill-suited to being adapted for accessibility. Eventually, after Steve has finished his rehabilitation, we would like to purchase a home that will be accessible (or can be made to be accessible) to Steve. Steve has a long, difficult road ahead of him, but we are so thankful that he is alive. Everything is very hard right now, but we have hope for the future. To help with the overwhelming costs of rehabilitation therapies and home and vehicle modifications, a fundraising campaign in Steveâ€™s honor has been established with HelpHOPELive, a nonprofit organization that has specialized in medical-needs fundraising for 30 years. All contributions are tax-deductible, are held by HelpHOPELive in the Midwest/West Spinal Cord Injury Fund, and are administered by HelpHOPELive for injury-related expenses only. Our family thanks you for helping us as we attempt to reclaim Steveâ€™s independence, mobility and quality of life. Every little bit counts, and each donation is greatly appreciated. Thank you for kindness and generosity. Steve, you don't know me but our family is praying for you....miracles do happen. I would like to email you a home that is already totally outfitted for your condition.My email is [email protected] God bless you! Steve ... You are as strong as your Mom and Dad and we have faith that you will be strong and determined and make miracles happen. Our prayers are with you always. Hey Steve and Sarah -- we're pulling for you and hope you get through this stronger than ever <3 Much love to you and your family! Steve you helped Virgil and I with repairs to my van when we needed it, and you and Sarah have come through to help others so often too. All our thoughts are with your family now and going forward! I have known you since you were a little boy, Steve. You come from very strong and beautiful parents. You have so many people who love you and are praying for you. Stay strong and know that there are miracles in this world. Much love and blessings. You have a long way to go, but you are strong and we are so proud of you.